Second week of Bakersfield Mist opens today! The show is on it's feet and audiences are loving it! "Wow! Just wow! I'm going to be thinking about this for weeks!" Amy S.
"I loved Clark Gable Slept Here - but you've topped it with this new one. I'm coming back and bringing friends!" Tom M.
Come see what they are talking about! We are really proud of this one - it's like nothing we've done before. 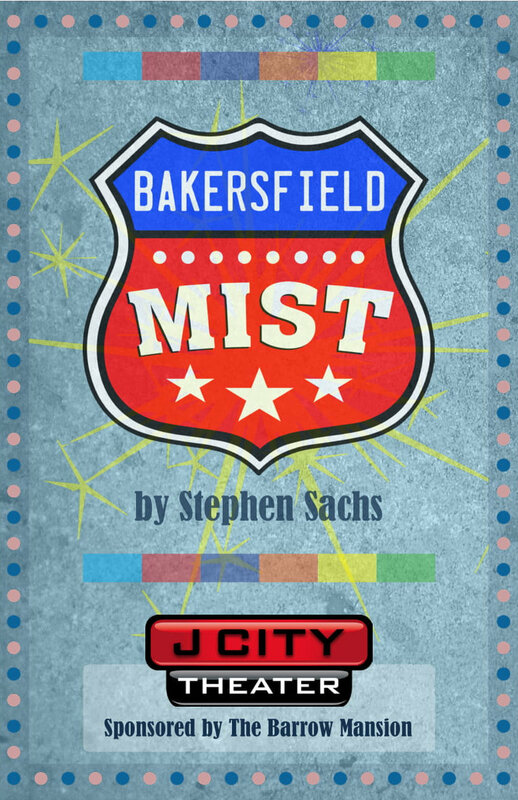 On Friday September 28th, J CITY Theater launches their first full season in four years with their Fall show: BAKERSFIELD MIST, by Stephen Sachs at their new location – The Barrow Mansion, 83 Wayne Street. Performances begin at 8pm Thursdays through Fridays and 3pm on Sundays. Audiences are encouraged to reserve tickets due to limited seating and a limited run. The show is scheduled to close on October 13th. Audiences may remember that J CITY Theater lost their performance space 4 years ago, but returned to the stage last May with Clark Gable Slept Here at The Barrow Mansion. The location has worked out quite well and they are proud to announce a full season and to call The Barrow Mansion their new permanent home! The season is kicked off with BAKERSFIELD MIST – a recent hit in London. BAKERSFIELD MIST, set in a downtrodden trailer park in California, is the story of Maude Gutman (Sandy Cockrell) who has recently purchased an ugly painting at Daisy’s Junk Shop for three dollars. Turns out, the painting may actually be a lost masterpiece by Jackson Pollock. Lionel Percy (Marvin Bell) is the former head of the Metropolitan Museum of Art and a current art expert who has come to her mobile home to authenticate the piece. This comic and poignant play explores the nature of art and truth and is a raucous clash of cultures. Audiences may remember Marvin Bell from his portray of Hank, the gay interior designer in the 2012 J CITY production of Regrets Only. His return to the Jersey City stage brings back sweet memories and J CITY is proud to bring him back. J CITY always collaborates with a local artist to display their work in their lobby. The featured artist for this production is Alex Sobolta who is also creating the original “Pollock painting” that will be used in the show. Mr. Sobolta states that Pollock has been an early inspiration to him as a painter and he is thrilled to contribute this amazing piece. The painting will be auctioned off at the end of the show and all proceeds donated to the theater. For this upcoming production, J CITY has added matinees to their schedule. On Sunday September 30th and October 3rd productions will begin at 3pm. Mr. Cockrell feels that the matinees will appeal to the brunch crowd. J CITY Theater has been a professional theater company for the past 14 years, employing actors and stage managers that are members of the Actor’s Equity Association They are known for creating high quality productions that are engaging and thought provoking; focusing on re-staging Tony Award winning and Pulitzer Prize Award winning scripts. They have enjoyed great reviews in both The New York Times and The Star Ledger. At this time, the full season is planned to include A Tuna Christmas in December and A Doll’s House Part 2 in the Spring. Details to follow soon. Our audiences have always been our greatest champions, said Ms. Cockrell. There hasn’t been a week gone by that we haven’t received an email or been stopped on the street by a former audience member to tell us that are so excited that we are back. Their support and encouragement has kept us going and we are so excited to see them again in our new home!